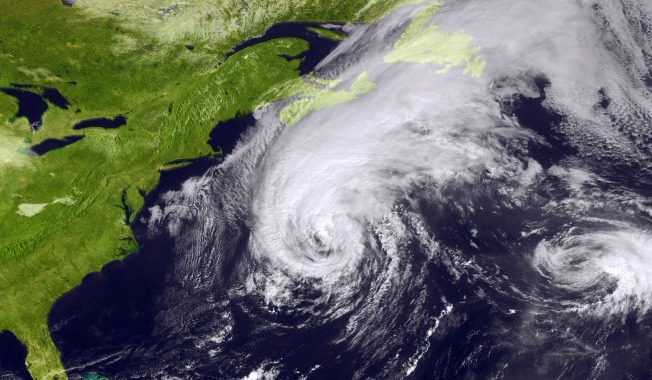 In this handout satellite image provided by the National Oceanic and Atmospheric Administration (NOAA), Hurricane Igor churns in the Atlantic Ocean as it moves north-northeast of Bermuda September 20, 2010 as seen from space. Researchers who set out to create a baseline for future research on water cycle trends on Monday reported an alarming discovery: 18 percent more water was fed into the oceans from rivers and melting polar ice sheets in 2006 than in 1994. "That might not sound like much — 1.5 percent a year — but after a few decades, it's huge," researcher Jay Famiglietti said in a statement released with the report in the peer-reviewed Proceedings of the National Academy of Sciences. "In general, more water is good," said Famiglietti, an earth system professor at the University of California-Irvine. "But here's the problem: Not everybody is getting more rainfall, and those who are may not need it. "What we're seeing is exactly what the (U.N.) Intergovernmental Panel on Climate Change predicted, that precipitation is increasing in the tropics and the Arctic Circle with heavier, more punishing storms," he added. "Meanwhile, hundreds of millions of people live in semi-arid regions, and those are drying up." The experts suspect that the evaporation and precipitation cycle of water is accelerating dangerously because of greenhouse gas-fueled higher temperatures. That, in turn, would trigger more severe monsoons and hurricanes. "Hotter weather above the oceans causes freshwater to evaporate faster, which leads to thicker clouds unleashing more powerful storms over land," the statement said. "The rainfall then travels via rivers to the sea in ever-larger amounts, and the cycle begins again." The researchers said they used satellite data on sea level rise, precipitation and evaporation to create what they called the "longest and first of its kind" record on global water discharge. Over the 13 years studied, they added, "the trends were all the same: increased evaporation from the ocean that led to increased precipitation on land and more flow back into the ocean." The experts cautioned, however, that 13 years is a relatively short time frame and that longer-term studies are under way.